In this miniature depicting the Flight into Egypt, the Virgin, baby Jesus, Joseph, and a female attendant escape to Egypt to elude Herod's soldiers, who search for Jesus to kill him. The artist squeezes the figures into the foreground, while a deep vista unfolds behind them. The long path winding back in space conveys a suggestion of their long journey. In the border, the illuminator included a figure cutting wheat and a soldier, referring to the Miracle of the Wheat Field, an apocryphal story about the soldiers' unsuccessful search for Jesus. 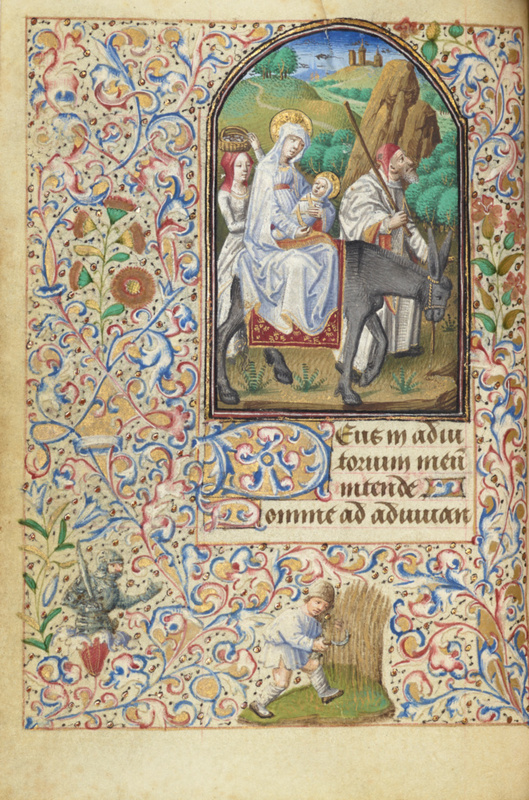 This miniature in Simon de Varie's book of hours accompanies the Vespers text of the Hours of the Virgin, a series of prayers devoted to the Virgin Mary. It begins with the second verse of Psalm 69, Deus in adiutorium meu[m] intende(God, come to my assistance). A cycle of miniatures featuring images drawn from the New Testament and sacred legend traditionally illustrates the Hours of the Virgin. An anonymous artist known as the Master of Jean Rolin II painted the miniature. He used a light palette characterized by an abundant use of white, as seen in the figures' clothing and the foliage in the border.